Tokyu Hands is like a really expensive Daiso. Think weird, cool or just plain kawaii Japanese gadgets, only, well, a lot more than $2 each. But it’s definitely a fun place to shop for gifts, especially when you’re really stumped for ideas. Since Christmas is coming, the MoneySmart team decided to troop down to Tokyu Hands’ Orchard outlet to get some gift inspiration. Being a bunch of penny-pinching journalists, we also checked our favourite e-commerce sites to see if we could find similar “dupes” at lower prices. … I know. Reprehensible behaviour. But what to do? We’re cheapskates. 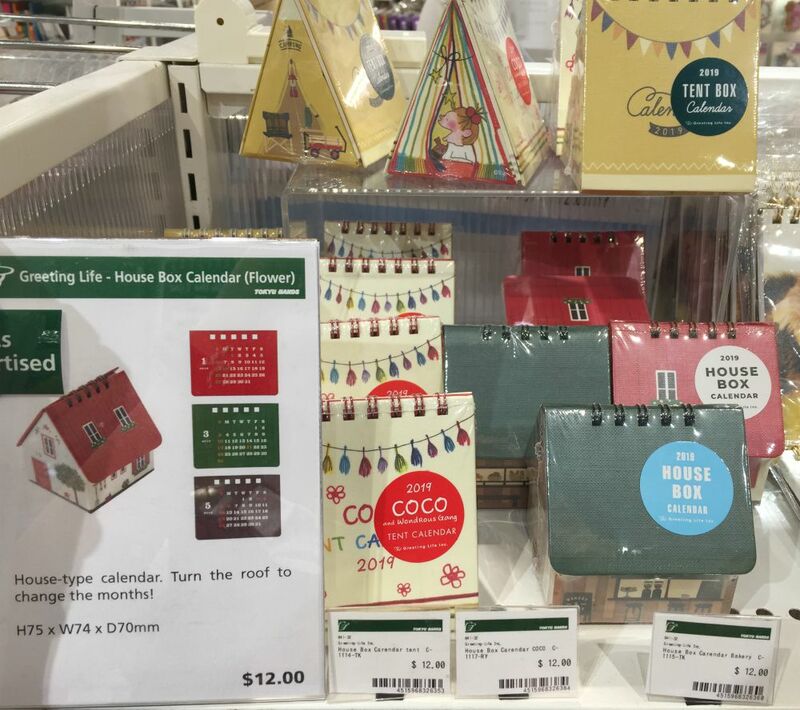 Here are 17 of the best gift ideas at Tokyu Hands Singapore, and where you can find cheaper alternatives (if any). * Cheaper alternatives are not always perfect substitutes. The things we saw at Tokyu Hands, though often more expensive than similar made-in-China products, are brilliant. In many cases, you will get what you pay for. If you do end up buying cheaper alternatives, bear in mind that there will probably be a sacrifice in design and/or quality. A simple little soft toy animal that you clip on the business end of your cable to protect your fingers from electrocution from any splits or tears in the insulation. But that’s not really the point. The point is that it looks sooo kawaii when you charge your phone and the little animal “bites” your device. 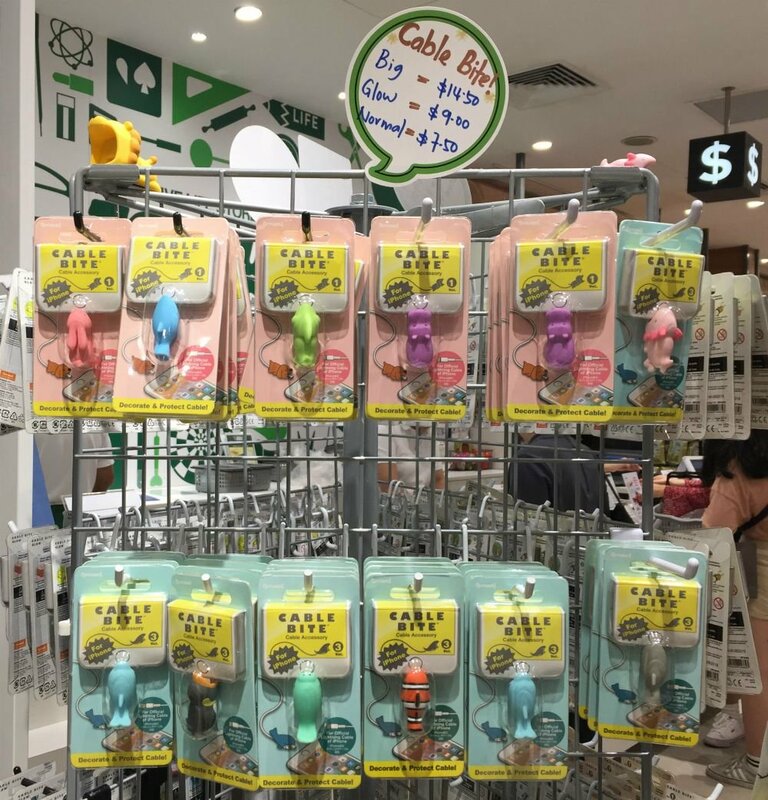 Ever since these novelty items started popping up, Singaporeans have been claiming that they “need one” regardless of whether their cables are actually spoilt or not. Some people even string multiple toys along their entire cable. These things are quite pricey at Tokyu Hands, but fortunately they are easily obtainable on Qoo10 for $1.90 or $2.90, and they seem to be the exact same thing. Bear in mind that shipping usually costs more than the object itself, though. 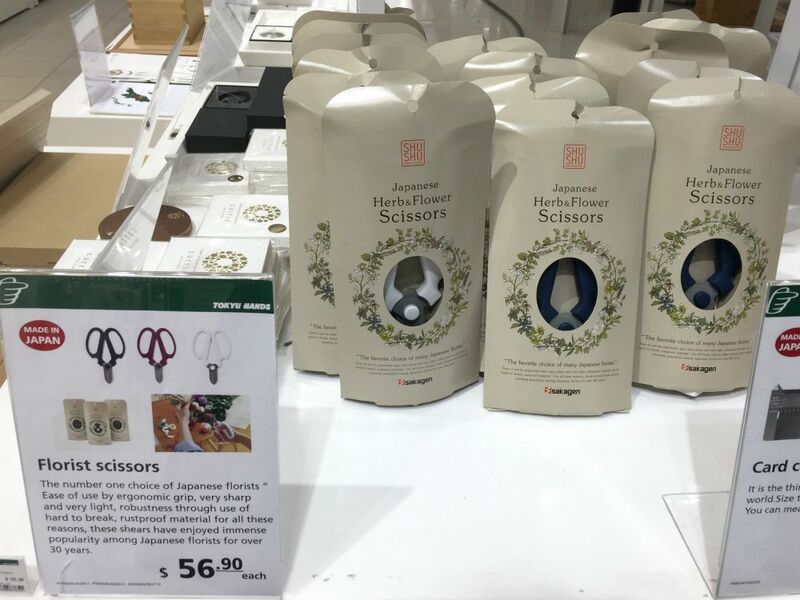 An article about Tokyu Hands would be incomplete without mentioning Japanese brand Hario (which I also happen to be completely obsessed with). 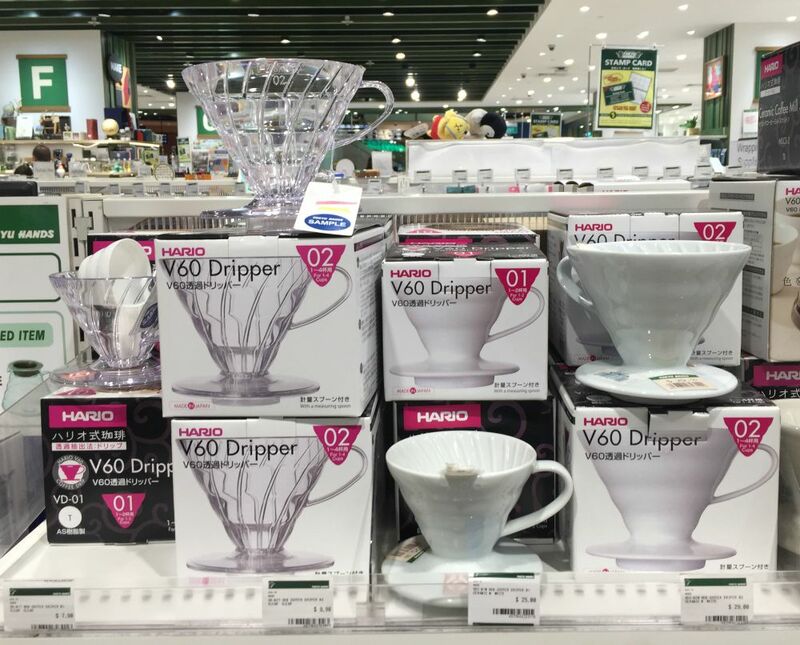 You’ll find Hario coffee making products all over the shop, literally. In my personal and completely biased opinion, the classic Hario V60 coffee dripper is one of the best gifts one can give or get. It’s functional, good-looking, and greatly improves your quality of life – just like the person receiving the gift, presumably. Tokyu Hands stocks it in 2 varieties: clear plastic ($7.90 for small / $9.90 for medium) and white ceramic ($25 for small / $29 for medium). Or maybe you’ve got that friend who’s always buying $10 cold brews at trendy cafes. 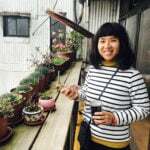 In theory, you’d be helping her save money if you buy the Hario Mizudashi cold brew coffee pot ($24 for 600ml / $29.90 for 1l). Right? Right? 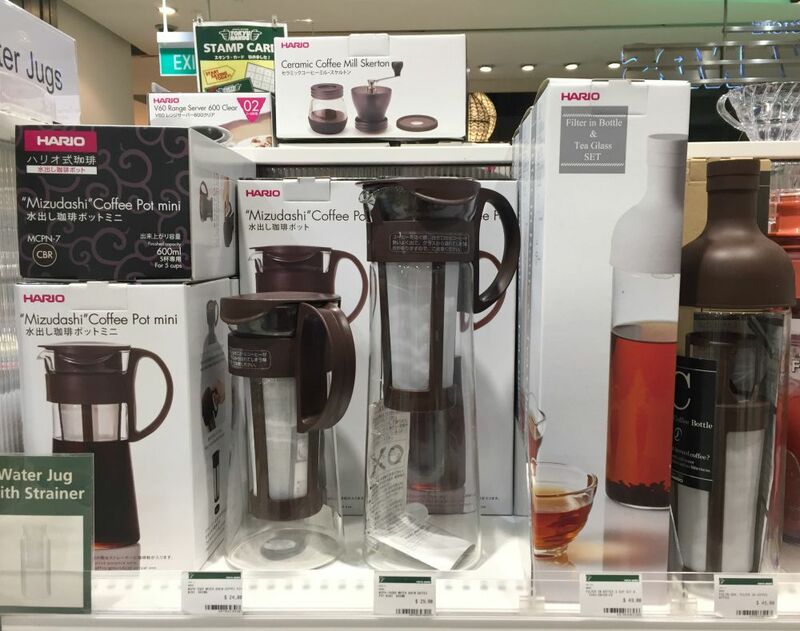 As far as I know, Tokyu Hands is the cheapest place to find these Hario products in Singapore. Even our beloved online marketplaces like Lazada are selling them for higher prices. No matter how cheap they are, going for frequent massages in Singapore isn’t easy on the wallet. So having some kind of self-massage tool around is great for quickly fixing that “text neck” without spending $70 on a full-blown massage. 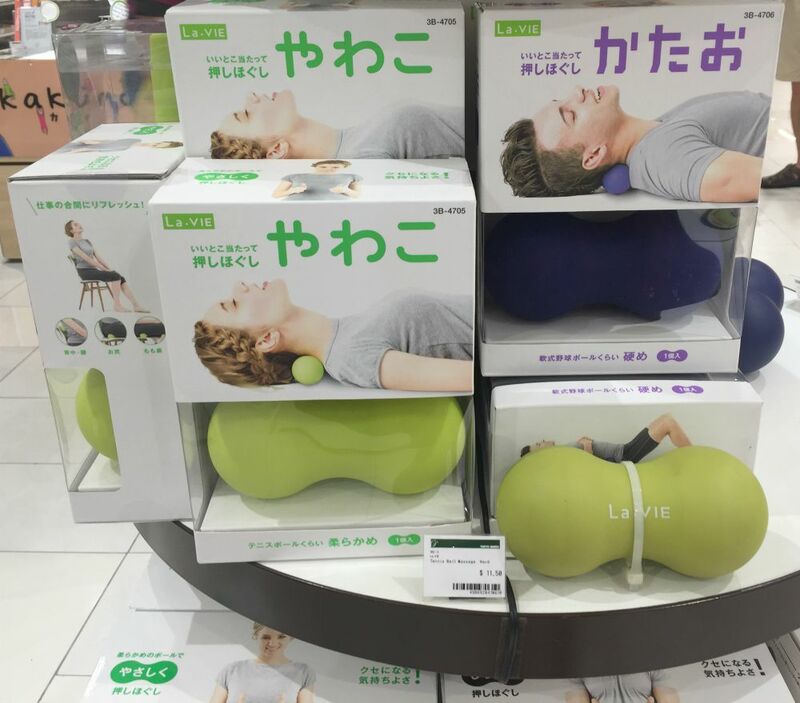 The Lavie massage ball at Tokyu Hands fits the bill. Even though it’s basically 2 lacrosse balls stuck together, it’s nonetheless reasonably priced and nicely packaged. More importantly, does not look the slightest bit obscene. Which, unfortunately, cheaper substitutes like this $4.90 one from Decathlon do. No one gives out desk calendars as corporate gifts these days, which is a crying shame for those of us who, um, have trouble keeping track of which month it is. At least, that’s my excuse for wanting to buy this house-shaped 2019 calendar. It’s got absolutely nothing to do with how cute it is to flip the roof to change the month at all! No siree. If you’re curious, similar items can be found on our favourite e-commerce sites. The cheapest I found was $2.83 on EZbuy (nowhere as cute as the Tokyu Hands one). Hopefully it’ll ship in time for 2019. Soap dispensers are one of those inexcusable purchases. You definitely do not need it since most bath products already come in their own dispensers. And you do not need the hassle of transferring your shower gel from its own soap dispenser, into your personal soap dispenser. 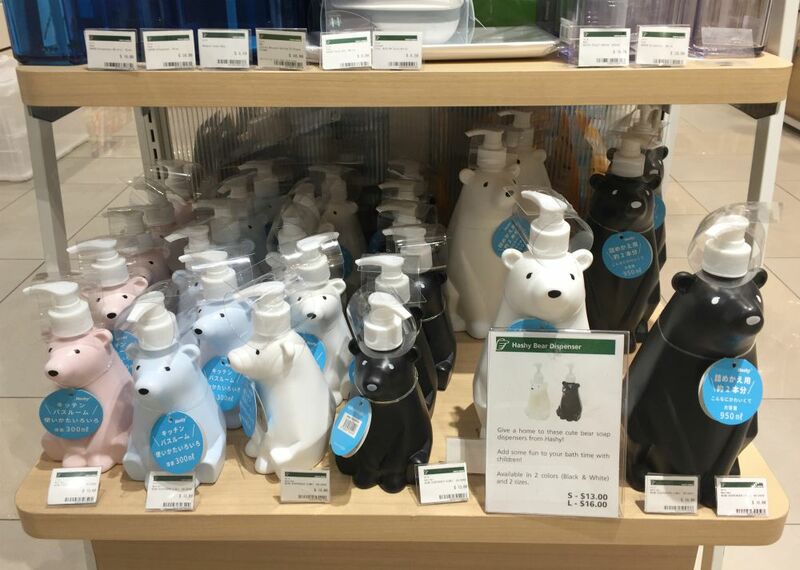 However, when said soap dispenser is shaped like a bear, “need” has absolutely nothing to do with it. Just look at its comma-shaped eyes!!!! FYI, it’s puzzlingly hard to find a similar product elsewhere. My searches online have only yielded gross soap dispensers like this nose-shaped monstrosity. Know someone who’s so addicted to mahjong, they actually turn you down when you jio them to travel because they refuse to be parted from their favourite game? 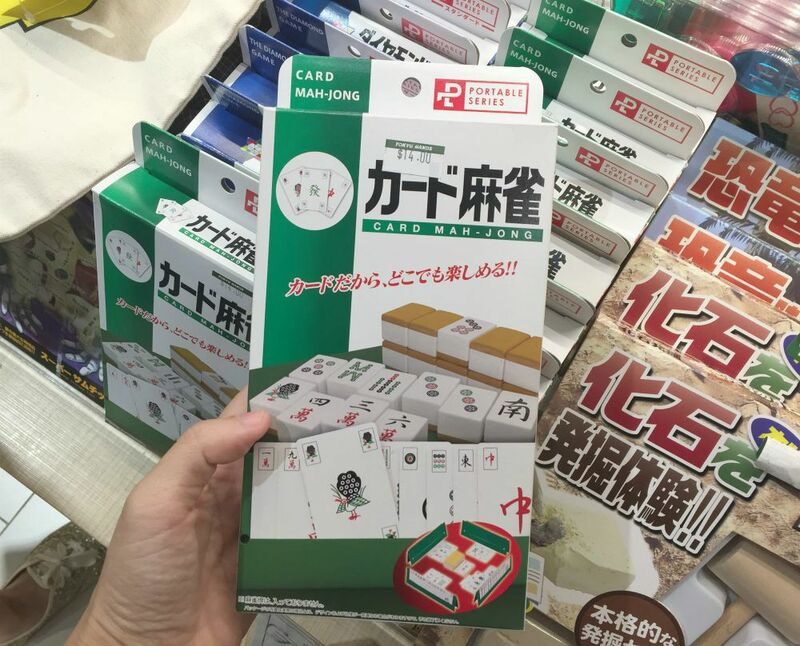 Umm, I don’t, but in case you do, this mahjong playing card set from Tokyu Hands makes the perfect gift. Decks of mahjong playing cards are actually not hard to find, and you can snag a set for as little as $5.40. However, this is the only product I’ve found that actually comes with a “tile rack”, which I think is essential for the mahjong experience. Otherwise, you might as well be playing Uno or something. 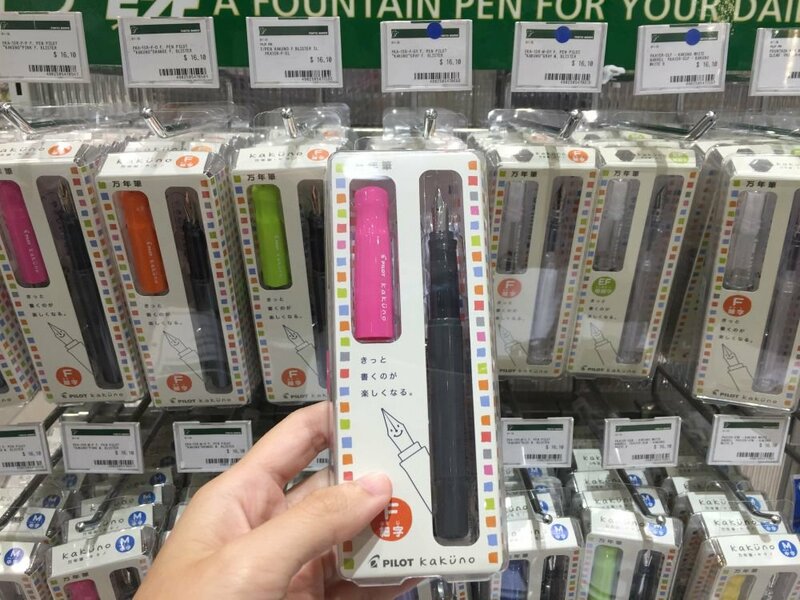 One of the most worth-it things to buy at Tokyu Hands is their range of $16.10 Pilot Kakuno fountain pens. These brightly-coloured pens are a cheaper alternative to the Lamy Safari series, also a “fun” fountain pen, but at almost 3 times the price (retail price: $49). If you have an artsy or writerly friend – you know, the kind of person whose eyes light up when you give them a Moleskine notebook – this makes the perfect cheap but nice gift. Oh, if you’re looking for cheap fountain pens, Iuiga stocks quite a few Lamy knockoffs at $7.20 each. But with the Pilot ones, at least you can test them in person first. This was the first time I’ve ever seen ice cream spoons that cost this much. Gobsmacked, I dragged my colleagues over to look at the spoons, expecting them to exclaim over how overpriced these things are. Upon a closer look, they appear to be designed for optimum ice cream scooping (serrated edges + aluminium body conducting your body heat to melt the ice cream). I suppose $16.90 is a reasonable price for a piece of fine Japanese engineering. 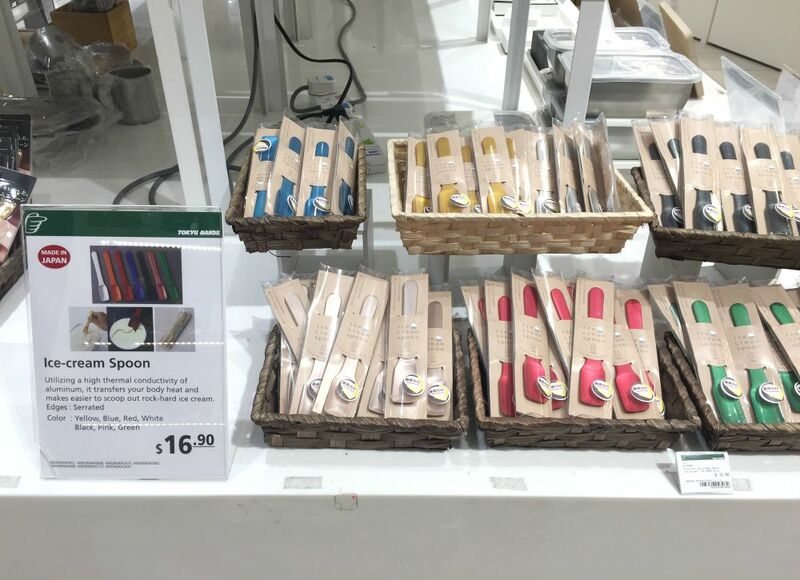 Alternatively, you may consider cheaper options like this $3 Muji spoon or this set of 4 for $7.10 on EZbuy. A self-watering plant like this is the perfect gift for that colleague who’s always stressed out at work and way too busy to remember to water a plant. These cute little things are from Japanese brand Seishin, which makes a very impressive range of desk plants. 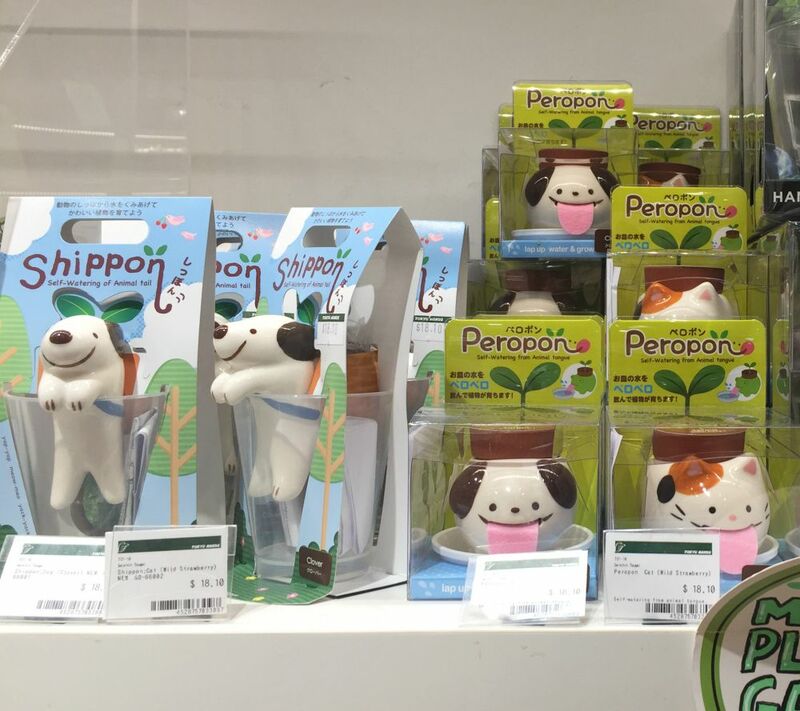 The cheapest and cutest ones are the Shippon range (where the dog’s tail does the plant watering) and Peropon (where the dog/cat’s tongue waters the plant). Before you buy these for $18.10, however, I found the same product retailing at $16.90 from Shinnpark on Redmart and Lazada. Shinnpark has a good range of Seishin products on both sites as well, in case you want something more grown-up than giant wet tongues. Yet another Tokyu Hands product that I didn’t know I needed until I actually saw it, this is simply a butter-sized box with a wire cutter frame. Place softened butter on top of the wire frame and push it through with the lid on it. Theoretically, you should end up with perfect pats of butter, allowing you to recreate that Ya Kun Kaya Toast experience right at home. OMG, who doesn’t want that!? 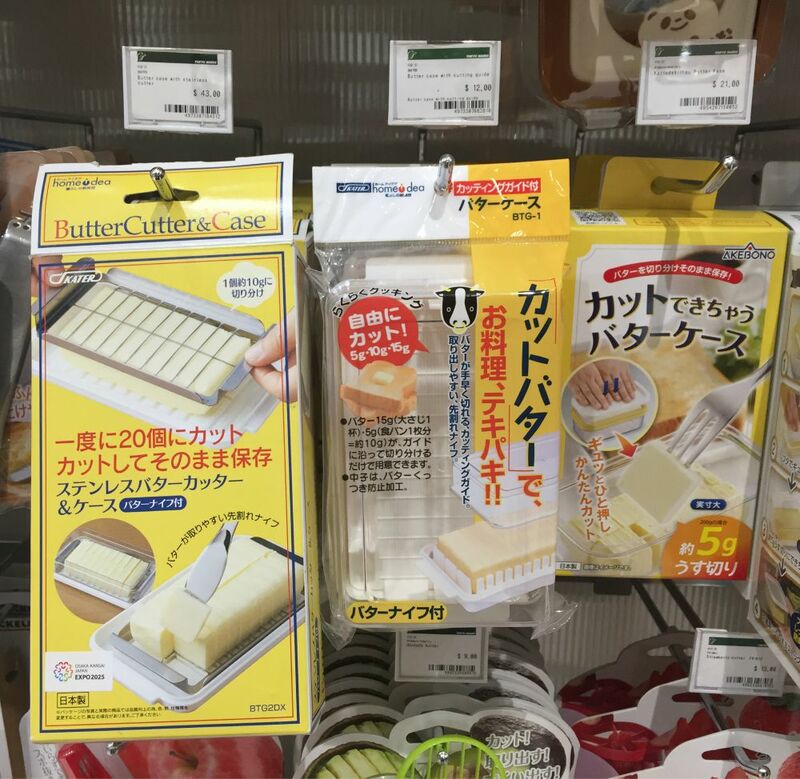 Surprisingly, the $21 butter case is actually cheaper at Tokyu Hands than on Qoo10 ($26.90). I’m a sucker for technical outdoor gear, so I was amazed at how small and light this little folding chair is. Look carefully – it even comes with a tiny pouch! It held me up just fine, but there’s a weight limit of 80 kg on this thing. 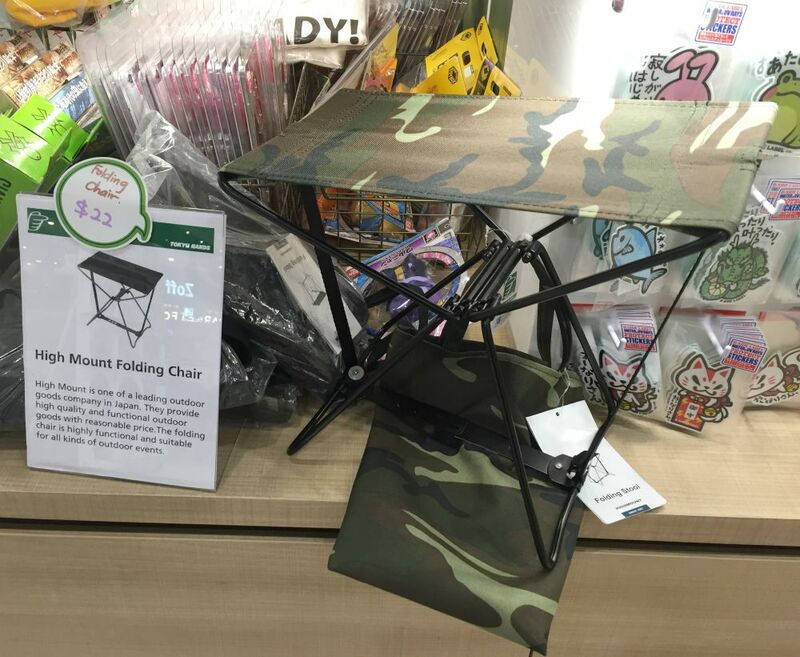 Although you can find cheaper folding camp chairs at the army market or this $15 one from Decathlon, this particular slim and light design isn’t easy to find. The cheapest “dupe” I could find was a $23.92 Rothco one from Hock Gift Shop. Okay, $50+ scissors? Now things are just getting out of hand. Nonetheless, I acknowledge the importance of good scissors when it comes to the craft of Japanese flower arrangement. You can’t exactly use your $2 stationery scissors from Popular – they’ll go blunt in no time. Plus, these scissors are designed with extra-wide grip (so you can grip the scissors fully) and short blades (better for precision snipping). So if you have a friend who’s crazy about Ikebana, this should make him or her happy. That said, the same Sakagen scissors are retailing for waaaay cheaper on Amazon, from US$23.33 to US$25.98 depending on colour. 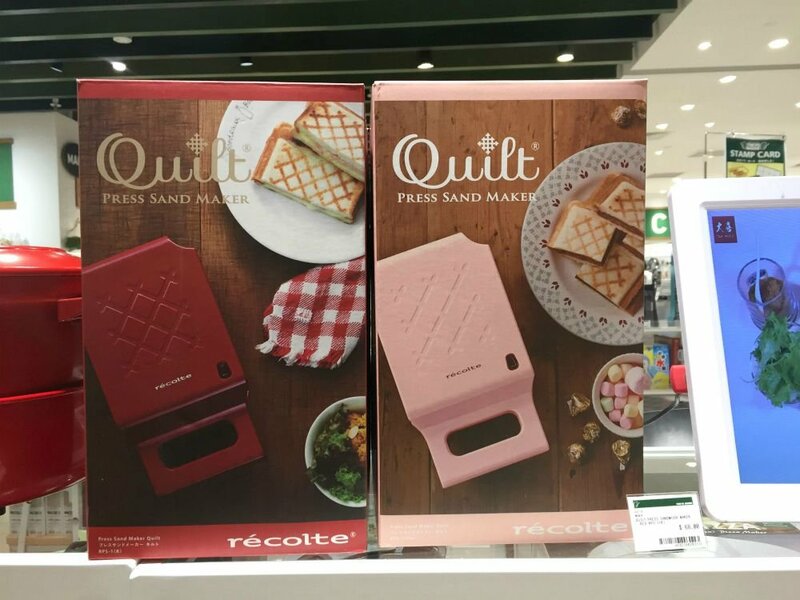 Like so many of the kitchenware at Tokyu Hands, this Recolte sandwich maker is totally overpriced, yet irresistible. Take my money already! I liked this impractical sandwich maker so much, I was really hoping to find a cheap duplicate elsewhere. But try as I might, I couldn’t find a good substitute. Although conventional sandwich makers abound online, going for as cheap as $26.37 on Lazada, they’re mostly bulky and ugly, not at all the kind of thing you’d want to display on your countertop. Everyone has got that one friend who’s always banging on about kombucha, kimchi and other fermented foods. A low-temperature food fermenter like this is the ideal gift for them, because it guarantees you free flow of homemade yogurt – talk about a return on your investment. This thingamjig lets you maintain the temperature of your choice, so you can use it to make other food items that involve fermentation, like cheeses and possibly alcoholic drinks. 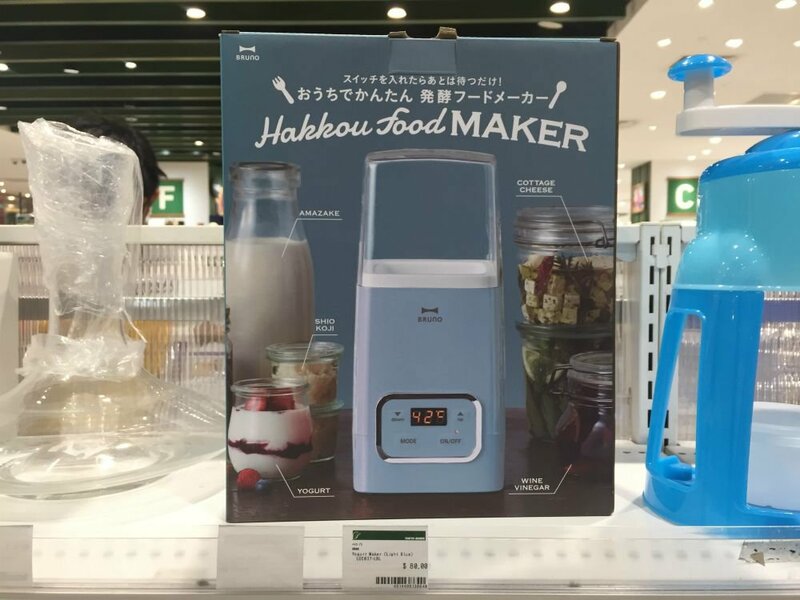 If you find the price tag hard to swallow – I do – there are many cheaper yogurt makers online, although it is much harder to find one that has precision temperature control. Here’s a $35.90 one on Qoo10 that does have this function. I don’t know what to say about this clock, apart from the rather staggering price and the fact that it’s made of cork. 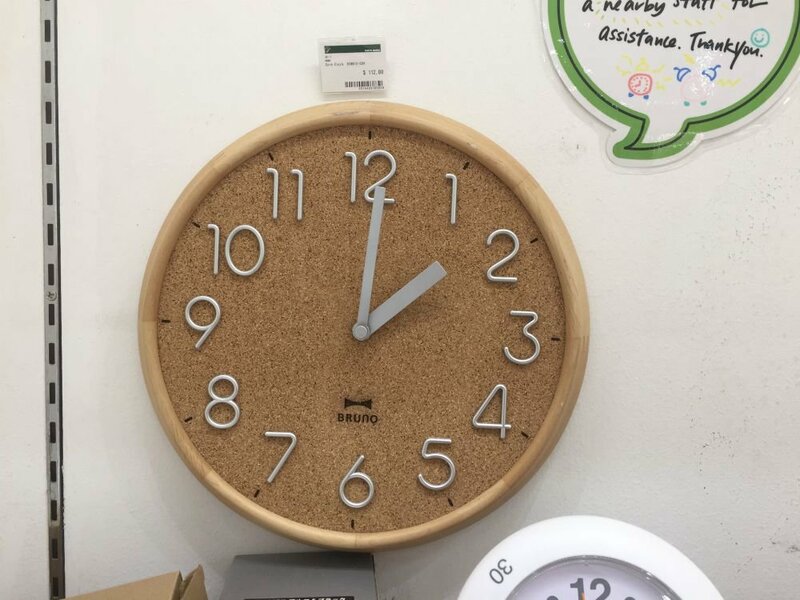 If it’s any comfort, it’s terribly hard to find a clock that’s made of cork. If you don’t want to splurge $112 on a timepiece, check out the very affordable clocks on HipVan, like this $19.90 walnut clock which has a similar aesthetic. 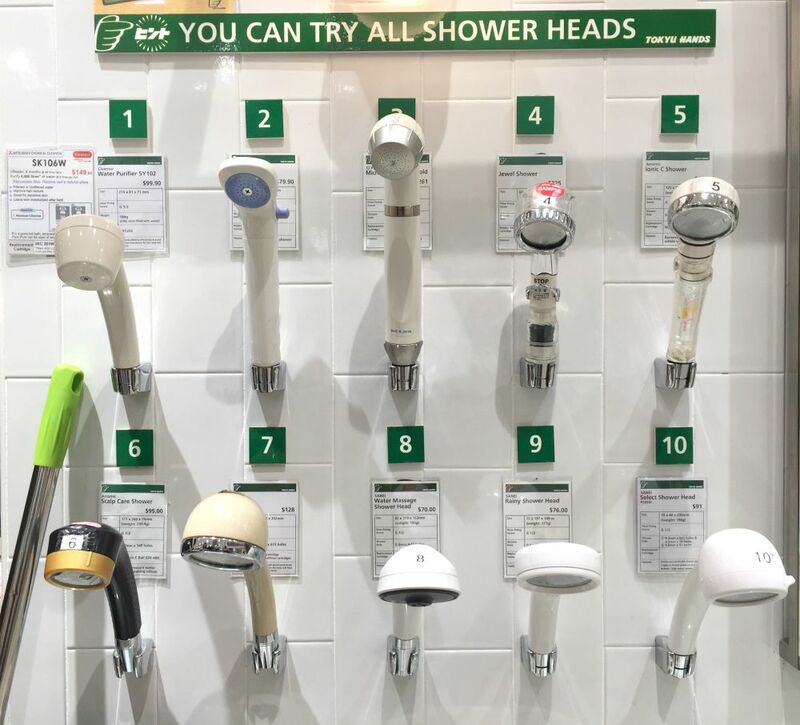 Apparently, shower heads are some of the hottest products at Tokyu Hands, and there’s an entire section dedicated to fancy shower heads. You can even test them out – just ask the staff! Please don’t strip down, though. The Amane shower head is one of the most popular shower heads here. If you look at the underside, it looks just like a solid piece of steel. The holes are so tiny that you can barely see them. And there are 615 of them on that one shower head! Anyway, forcing water through these microscopic holes means increasing the water pressure greatly while using the same amount or less of water. Which means a reduction in your utilities bill, unless you end up spending more time in the shower enjoying the super shiok hair salon-style water jets. FYI, the Amane shower head is also available on Qoo10 for $99.99. Other high pressure shower heads also available on the site, but it’s hard to beat the Amane in terms of the sheer number of holes. 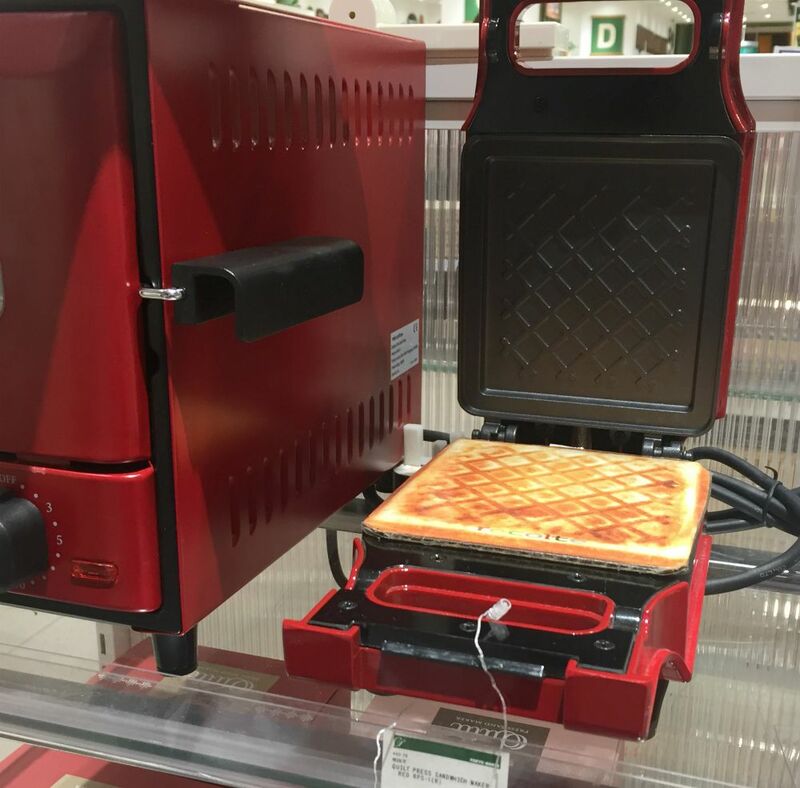 The small but powerful hot plate – about the size of an A4 sheet – is a favourite with families with young kids. I dare you to read this Bruno hot plate review and not feel tempted to get one. It seems that sizzling hot plates are universally thrilling for all children. If you have kids, this purchase might actually make economic sense in the long run. A plate of beef pepper rice at Pepper Lunch Express (food court) costs $6.90. Multiply that by a family of 4, and you’re basically spending close to $28 for rice and a few pieces of meat – purely for the amusement of your kids! 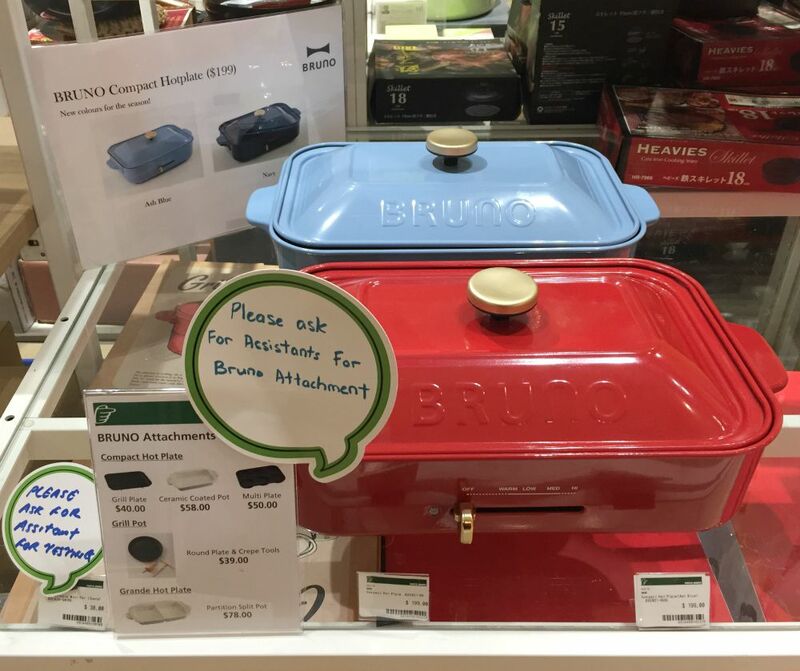 Including the cost of your ingredients, it would take 8 to 10 uses of this Bruno hot plate for your family to “break even”. Still, $199 is a high price to pay for teppanyaki at home. If you like the novelty of this product but don’t want to pay that much, you’ll be very glad to know there’s an “EC Home” knockoff at $98.90 on Qoo10. Tokyu Hands: wonderland of quality Japanese goods or repository of overpriced junk? Tell us your opinion in the comments.